Almost every country in the former Warsaw-Pact has one or more aircraft overhaulfacilities. Few countries have an aircraft manufacturing facility and even fewer countries have both. Romania happens to belong to the latter category with three indigenous aviationfactories which double as overhaulfacilities. The most ambitious of the three, and arguably the most ambitious aviationcompany of Eastern Europe, can be found in the North-East corner of the country. Going by the name of Aerostar, the company has made headlines in the past decade. If the enthusiasm and professionalism of the staff is anything to go by the company will remain in the spotlight for a considerable time to come. Located at the northern-end of Bacau's runway the Aerostar complex consists of a large number of hangars, workshops and officebuildings. Founded in 1953 the company was know as URA Bacau and overhauled most types in use with the Romanian Airforce (RoAF) including the Yak-17, Yak-23, MiG-15, MiG-17, MiG-19, L-29, L-39, Il-28, Hong-5 and their engines. In 1967 Aerostar's love-affair with the MiG-21 begun when the first Fishbeds of the F-13 subtype past through their workshops. 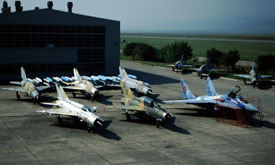 This type was followed by all MiG-21 subtypes in use with the RoAF; besides the F-13 the PF, PFM, R, M, MF ,U, US and UM could be found in the hangars of the company which was renamed IRAv Bacau in 1969. An ambitious plan was launched in the early nineties to upgrade the MiG-21M, -MF and -UM. Many of these aircraft were flying their missions from the various bases of the RoAF and they had considerable life left in their airframes especially after an overhaul and upgrade was carried out. Initially the Israeli firm IAI was approached for the ambitious upgrade plan. The project was dubbed 'programme DD' after Romania's great poet, writer and MiG-21 pilot Doru Davidovici who perished together with Dumitru Petra when their MiG-21UM crashed while in the pattern at Borcea airbase on 20 April 1989. Only a single prototype of the MiG-21-2000 was finished before Aerostar turned its attention and programme DD towards Elbit Industries which also has its origin in Israel. During the mid-nineties the programme started to take shape and the whole project was renamed Lancer. Three versions of the Lancer were to be build. For groundattack and recce the Lancer-A was developed followed by the 'two-seat Lancer-A' which received the designation Lancer-B. The dedicated air-to-air variant of the Lancer-programme became known as the Lancer-C. The 73 Lancer-A aircraft consist of a mix of the MiG-21M, MiG-21MF and MiG-21MF-75. The 24 Lancer-Cs were almost exclusively drawn from the pool of MiG-21MF-75 airframes. The MiG-21MF-75 differs from the basic MF in having some equipment used in the MiG-21bis. The MF-75 aircraft are also a few years younger than the MiG-21M and basic MF-variant. For most of the fourteen Lancer-B twoseater aircraft the youngest MiG-21UMs in the inventory were selected. In 1977 the first prototype of the IAR93 Vultur was constructed at Bacau with the first flights taking place from this airfield also. A new company at Craiova was selected to build the IAR93 and production-tools and expertise were moved there. The facility at Bacau did supply most of the hydraulic parts for the productionaircraft. In 1979 production of the Iak-52, the license-built version of the Russian Yak-52, commenced. More than 1800 airframes have been completed to date. Many were built for the Soviet Airforce with other examples being delivered to the airforces of Romania, Hungary and Vietnam. Today most are build for civil customers, many of them living in Western Europe or the USA. A westernized variant of the Iak-52, the Iak-52W, was introduced in 1998. This aircraft is equiped with a three-blade propellor and western avionics. The Iak-52TW equiped with a tailwheel first flew in 2001. Aerostar hopes that sales of the W and TW versions of the trainer- and aerobatics aircraft will continue in an even higher pace than before. On the 5th of May 2000 the prototype of the MiG-29 Sniper left Bacau's runway on its first flight. The Sniper is an upgrade package for the MiG-29 not only aimed at the Fulcrums of the RoAF but also trying to attract interest from other (European) countries operating this type of fighter. The cockpit of the Sniper is completely renewed when compared to the original example. As of today, no firm orders for the Sniper upgrade have been placed and Aerostar is hoping the RoAF will be the launch customer trusting its seventeen remaining MiG-29s in the hands of the company's skillful technicians. Production of light aircraft is another field of expertise of the Aerostar company. The 'Wild Thing' WT-01 first flew in 1994 and was followed by the Aerostar 1 in 2001. Both are ultra-light aircraft which are offered at a very competitive price when compared to Western-built ultra-lights. Recently surplus RoAF L-29s and L-39s have been offered for sale on the civil market. Sixteen L-39ZAs have been sold and all underwent an IRAN (Inspection and Repair As Necessary) at Aerostar Bacau. With the money the RoAF generates through the sale of surplus aircraft other aircraft still on the inventory can be overhauled. It is not difficult to see Aerostar benefits from the sale of these airframes. With its 50th anniverary around the corner in 2003 Aerostar is the living example for all Eastern European aircraft maintenance- and overhaulfacilities that there is a future after spending many years under Communist influence.